Don't let oil ruin your eye makeup. When you apply eye shadow, liner and mascara in the morning, you expect your makeup to stay put for most of the day. Oily eyelids, however, may cause your hard work to fade away before you even blink. Hormonal fluctuations are usually responsible for the grease, so take a deep breath -- your days of ruined makeup probably won't last forever. In the meantime, ward off oil by cleaning and degreasing your lids daily. Remove your eye makeup at night so it doesn't leave you with oily skin in the morning. To safely clean off makeup, dip a cotton ball in makeup remover, then press it against your eyelids for two to five minutes to loosen makeup, making it easier to wipe off. Wet another cotton ball with makeup remover, then gently rub your eyelids with small, circular motions. Rinse your eyes with cool water once the makeup is gone. 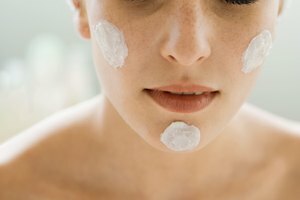 Cut back on eye cream, if you use it, because it can cause excess oiliness. Cover your lids with an eyelid primer before applying eye shadow to help the color last longer. Opt for a silica-based primer for more oil control. Once you've put on the primer, blink your eyes several times. If the primer creases, you've applied too much. Wipe some off with a cloth or tissue. As needed, dab your eyelids and the surrounding skin with blotting paper to absorb oil fast. Choose blotting papers that contain a sheer powder to give your skin a matte look. If your powder eye shadow won't stay on, apply a cream or gloss shadow instead. These will dry and set on your eyes, so they'll stay put even if your lids are oily. If you have blurred vision or puffy eyes, you might have a medical condition that's causing oily eyelids, such as blepharitis. See a doctor for assistance. Oprah.com: What's Up with Oily Eyelids? King, Melissa. "How to Keep Eyelids From Getting Oily During the Day." Synonym, https://classroom.synonym.com/keep-eyelids-getting-oily-during-day-13894.html. Accessed 21 April 2019.